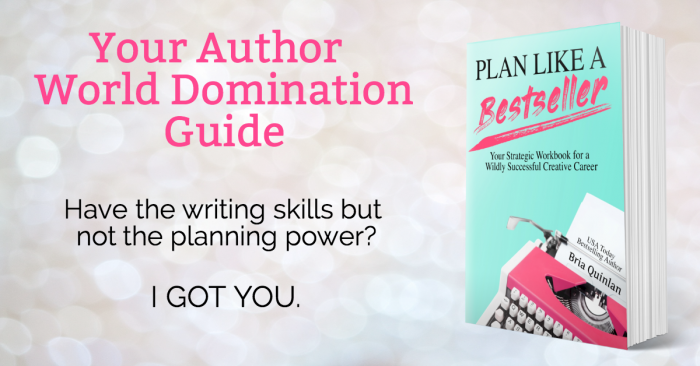 You are here: Home / Publishing / Plan Like a Bestseller … is LIVE! I’m so excited to give you the new and improved book. If you don’t follow me online, let me give you the quick and dirty. The AuthorLife Planner is no more. Every year we’ll price out creating an actual planner-planner, but we found when asked that over 90% of people who used this yearly didn’t use the planner pages because…book. INSTEAD what this version has is a new section: Long-Term Planning. I heard over and over again that people loved the year, but sometimes had difficulty pushing that out further on their own. The LTP pages have a 5-year focus, but are key to helping you picture the work you’ve already done leading you out as far as you want down your career path. Now, a bit of an odd note because I’ve never rec’d a specific vendor before. I *highly* recommend the Barnes & Noble color copy as the best version because the paper is heavier/thicker and the color is absolutely lovely….and the price is so much better than AMZ’s markup. It’s like $8 less (before the code below) for a better product. And, as always, we have the digital download. As suggested by several users after last year’s Selz fiasco, we’ve moved to etsy! So, here you go – and remember: Planning happens year round. Ignore the “new year hype” and find your happy planning groove!